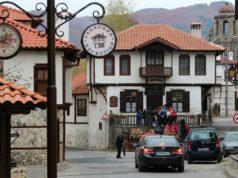 Zheravna is a small architectural gem located in the southern foothills of the eastern Balkan Mountains, not far from the major artery connecting Sofia with the southern Black Sea coast. A museum town with many fine National Revival buildings, Zheravna is an important historical reserve and budding tourist destination. 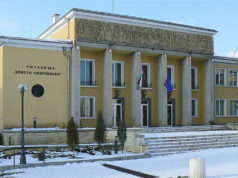 It is number 57 on the Bulgarian Tourist Union list of the top 100 tourist sites in Bulgaria. The sunny slopes and well fed streams of the Zheravna region provide an attractive setting for habitation, and archaeological evidence suggests that Thracians called this place home as early as the 1st or 2nd century of the Christian era. Pottery, jewelry and Roman coins are routinely dug up in local excavations. Ruins of the nearby Roman fortress Vida also speak to the ancient origins of human culture in the area. When the Slavs came, they settled in small hamlets scattered among the hills. The region was also a crossroads of two major transportation routes during the First and Second Bulgarian Empires. The first road ran south from Veliki Preslav, through Zheravna, connecting the old Bulgarian capital to the Thracian plain and the sea. The second connected the medieval capital, Veliko Tarnovo, to Constantinople and the Black Sea. It is reasonable to assume that traffic along both routes would have promoted development of the surrounding area. In fact, several monasteries were established in the region during the Second Bulgarian Empire. Zheravna grew out of more than 10 isolated villages around the time of the Ottoman conquest of Bulgaria. Local residents sought protecting by gathering together in closer community around the local watermills, or Zherki as they were called in the Slavic tongue. Ottoman sources dating as far back as the 16th century call the town Zherovine. It was also called Bash Kjoy, Turkish for chief village, a reference to its importance in the area. The earliest recorded use of Zheravna was by native son Rayno Popovich, a prominent 19th century Bulgarian educator. During the Ottoman era Zheravna enjoyed the status of a free village, granting its inhabitants the right to permanent land ownership in exchange for services rendered to the Turkish army transport units. During the 18th century, the town economy surged due to an expansion of animal husbandry, in particular sheep, and the growth of wool production. Soon most of the townspeople were engaged in the wool trade. High demand for woolen goods led to prosperity and development, as the town toiled to meet demand for woolen clothing, carpets, pillow and rugs. Other crafts developed as well, and the main street was lined with shops for leather goods, wood products, foodstuffs and more. There were several inns in town for traders and other guests traveling through. Merchants and farmers grew rich and built fine homes with wide eaves, bay windows, tile roofs and stone chimneys. Many of the houses included ornate interior decoration. Local roads were paved with stone. Considering the wealth of the town, it was not surprising that Paisii of Hilendar passed through Zheravna while traveling around Bulgaria. One of the earliest transcriptions of his influential Slavonic-Bulgarian History was made there in 1772, popularly known as the Zheravna copy. It was passed hand to hand for several generations until it was lost in the middle of the 19th century. Zheravna became the cradle of many leaders of the national revival movement, including Rayko Popovich, his nephew Rayno Popovich, called the teacher, Todor Ikonomov, Vasil D. Stoyanov and Save Filaretov. The town has a proud heritage in education, having sent many of its sons to the monastery schools of Mount Athos before opening its own school in 1834 in the yard of its newly constructed church. An impressive school building, still standing, opened in 1867. Zheravna played an important role in the national liberation movement. Exhorted by the likes of Vasil Levski, Angel Kunchev, Panaiot Hitov and Hadzhi Dimitar, the people of Zheravna were willing and ready to take part in the April uprising of 1876. Under the command of Petar Zheinov, the town prepared for the uprising in secret. On 7 May 1876, twenty two locals joined the fight with Stoil Voivoda’s detachment when he passed through. They were defeated shortly thereafter. The Turks infamously and cruelly returned to Zheravna with seven heads impaled on stakes, then paraded the townspeople past them to make them look at what had become of their men. Later on men from Zheravna participated in the defense of Shipka Pass. The town was liberated by Russian troops on the 8 January 1878. After the liberation shepherds moved their herds farther afield, families moved away, and the town entered a long decline. By the end of the Balkan Wars most of the population had left. By the middle of the 20th century the town was practically empty, and many of the once beautiful homes fell into disrepair. In 1958 Zheravna was declared a museum town and 172 buildings received designation as historical monuments. A team of experts started the long effort of restoring the town to its previous glory. Today Zherevna is an architectural preserve with over 200 buildings from the national revival period. Many of the wooden structures exhibit fine workmanship and preserve the lifestyle of well to do country homes. Some have become museums, others inns, restaurants and cafes. Saint Nicholas Church. Completed in 1834, the church was renovated in the 21st century and houses fine icons from the 18th and 19th centuries. Yordan Yovkov Birthplace. A house museum with exhibit dedicated to the life of the famous writer. Includes an interesting map of locations around Zheravna mentioned in his works. Sava Filaretov House Museum. 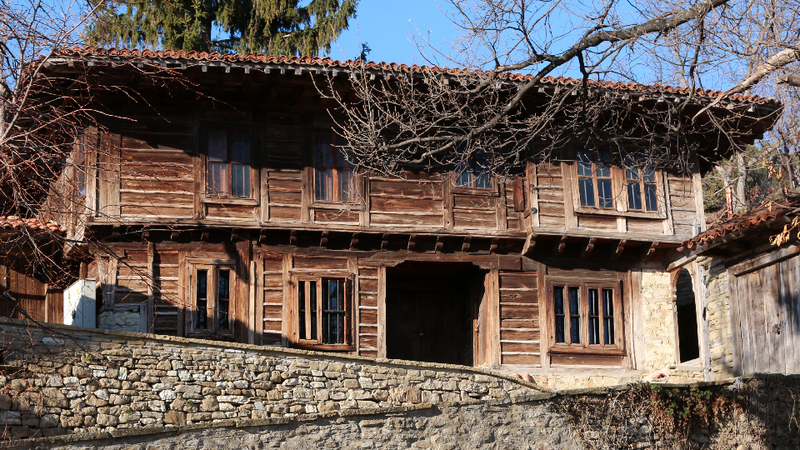 Birthplace of the influential Bulgarian teacher. Roussi Chorbadzhi House Museum. One of the oldest houses in Zheravna, almost 300 years old. A fine example of how the wealthy lived.